I have already posted few chat tips for Facebook. 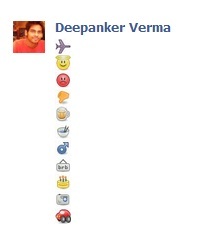 In this post, I am again with few more smileys for Facebook that are hard to find. So you can now impress your friends with these cools smileys. These are the codes for these similes. Just copy these codes and past in the Facebook chat box. Don’t forget to say thanks in the comment box. To receive this kind of tips in emails, subscribe UseThisTip.